The Super Bowl represents one of the most revered sports competitions in the United States, and not just for the teams that play in the game. However, there's another battle that goes on between the companies that vie for viewers' attention when they purchase one of the multimillion-dollar advertising spots that are shown during NFL's Big Game. In fact, it's not uncommon to hear people discussing their favorite TV commercials more often than they discuss the game itself. At CreditLoan, we like to understand the factors that play into people's purchasing decisions, so that's why we surveyed over 100 Americans immediately after this year's Big Game. We calculated an overall score for each ad by averaging how well our survey respondents remembered the ad, how entertained they were by it, whether their overall view of the product changed positively or negatively, and how much their purchase intent was changed positively or negatively. Our findings can help indicate how people felt about the ads they saw and how those feelings might affect the products they buy in the future. Let's get into the results! 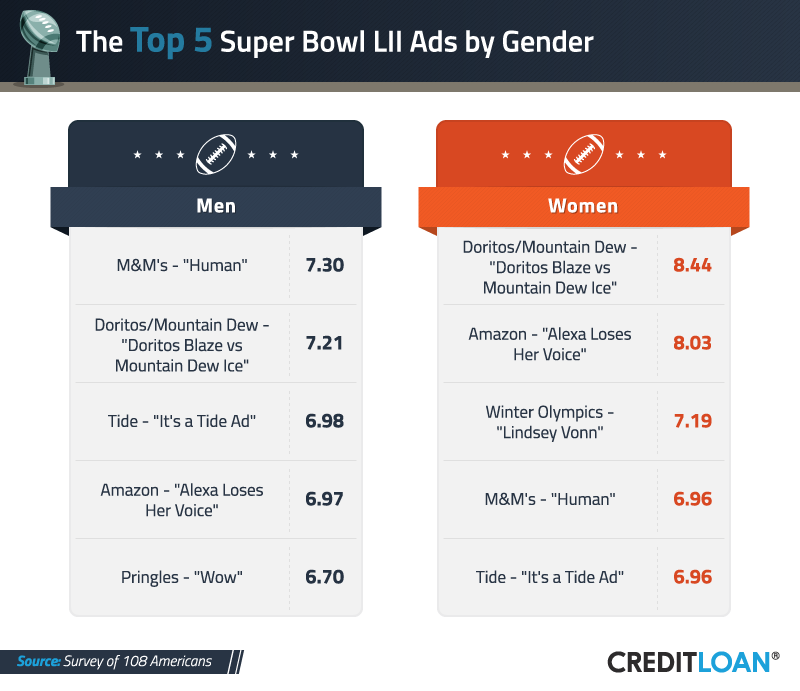 The clear overall winners for this year's Super Bowl ads were Doritos/Mountain Dew, Amazon, and M&M's. Ads by these companies scored above a 7 out of 10 points overall. Commercials by Tide and Pringles rounded out the top five when it came to their overall score. But advertisers ultimately want viewers to buy their products. That's why we also looked at each ad's effect on people's purchasing intent. The winners in this category were a little different. M&M's, Doritos/Mountain Dew, Tide (with two ads), and Pepsi rounded out the top five for their reported effect on consumer purchasing. 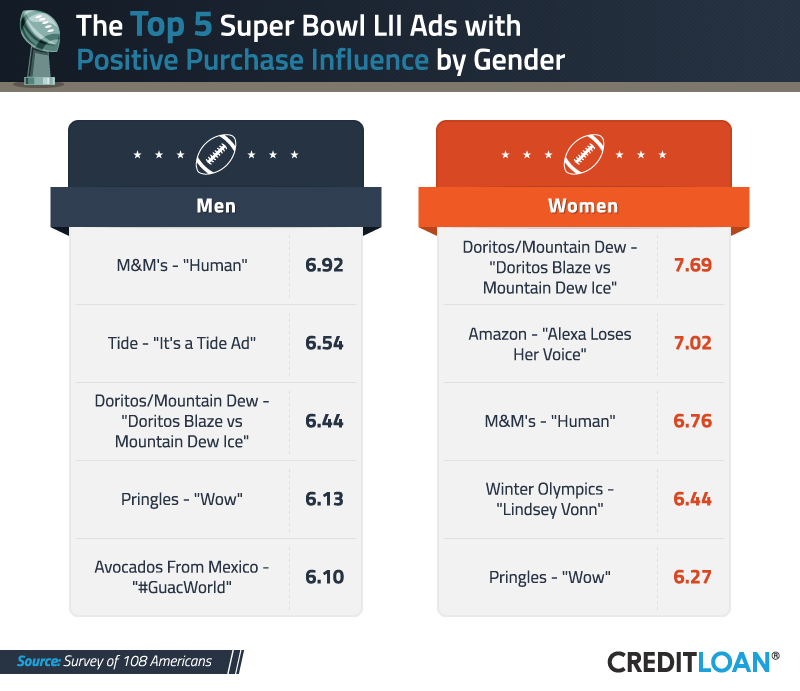 It turns out men and women both rated the Doritos/Mountain Dew commercial highly. But they didn't totally agree when it came to the commercials that rated the most highly this year. For men, M&M's spot "Human" rated the most highly overall. Perhaps the guys had a bit more of a sweet tooth. When it came to women, however, the Lindsey Vonn ad promoting the Winter Olympics ranked among the top five. It did not appeal to men as much, with our male respondents rating the ad at only a 5.75 out of 10. There's no question that ads can entertain, but can they actually influence our purchasing decisions? When we asked men and women to rate each ad's effect on their likelihood of purchasing the featured product, the M&M's "Human" ad ranked highly for both genders. But commercials promoting both Pringles and Avocados From Mexico seemed to influence men more strongly to buy those products – even though those commercials didn't appear on the overall top five list. For women, the Amazon Alexa ad was not only one of their favorites overall, but it also ranked highly for its effect on purchase intent. We were curious if age might play a factor in advertising appeal during the game this year. And it turns out it did. For millennials and Gen Xers, Doritos/Mountain Dew took the top spot. But that ad didn't even place for baby boomers. Perhaps the older folks just aren't that into hip-hop? Baby boomers rated Chris Pratt's Michelob Ultra commercial the most highly, and they also gave a nod to Universal's "Vacation Quarterback" ad starring Peyton Manning. One ad this year seemed tailored to a specific age group more than the others, though: E-Trade Financial's "This is Getting Old." But the ad didn't score very highly with any age group. In fact, it was rated highest by Gen Xers, coming in at 6.42. Did the votes vary when it came to supporters of a particular team? It turns out they did. 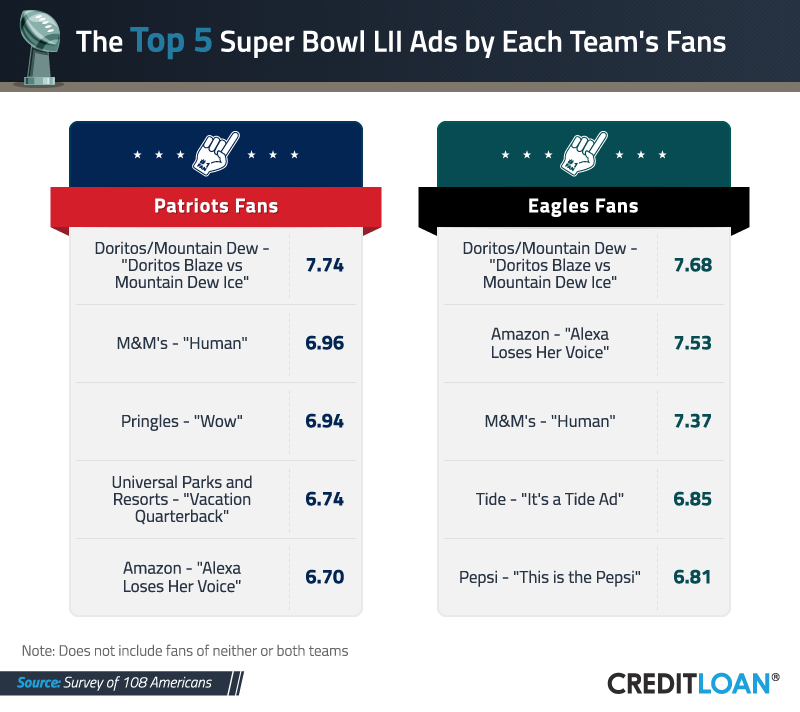 Both teams' fans rated Doritos/Mountain Dew, M&M's, and Amazon ads highly, but Eagles fans seemed to prefer Tide and Pepsi ads. People supporting the Pats liked ads from Universal Parks & Resorts and Pringles a little more overall. This was surprising to us, since we assumed Patriots fans wouldn't take kindly to seeing rival quarterback Peyton Manning up on the screen. No matter their political affiliations, Americans can often find issues they agree on. 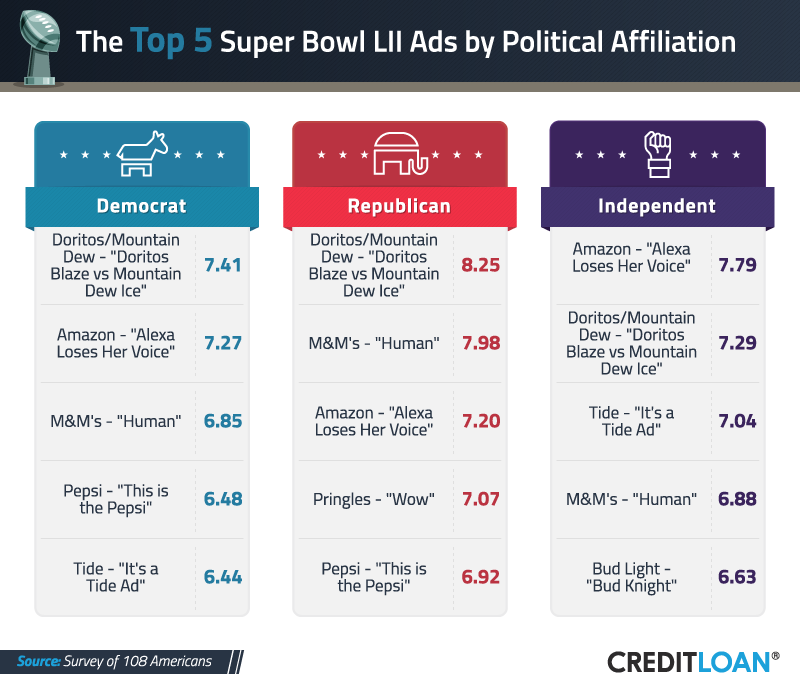 The top-ranked ads this year showed strong alignment, with respondents from different political parties agreeing that ads from Doritos/Mountain Dew, Amazon, and M&M's ranked highest overall. Republicans seemed to rate the ads they liked more highly, while Democrats and Independents gave somewhat lower scores across the board. When it comes to controversy, however, there was some disagreement along party lines. The Dodge ad "Built to Serve," featuring a speech read by Martin Luther King Jr., ranked as the most controversial among Democrats and Independents. But it was Blacture's "Be Celebrated" ad that took the top spot for Republican respondents. Republicans also seemed to take issue with T-Mobile's "#LittleOnes" spot, as well as Febreze's "Bleep Don't Stink." 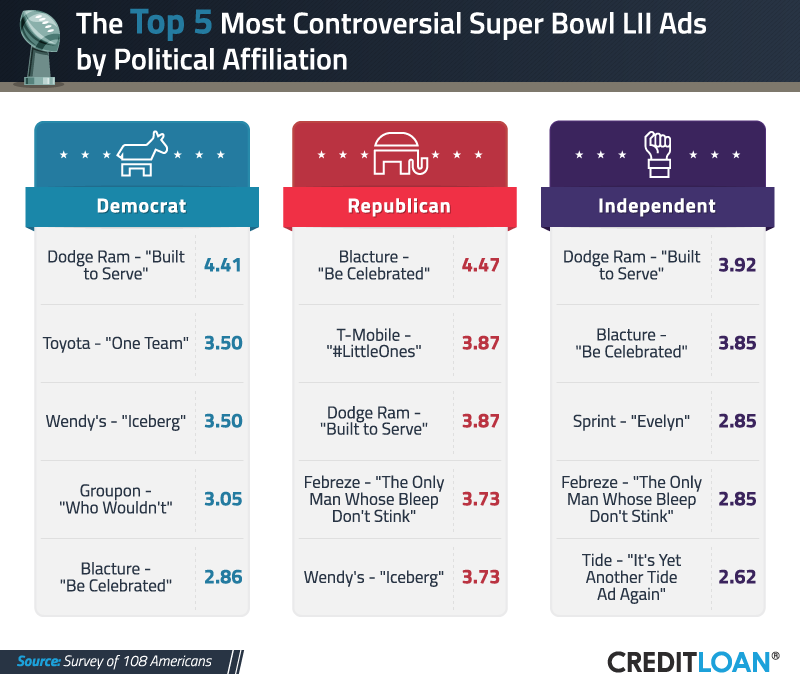 Democrats felt Toyota's "One Team" ad deserved points for controversy, and Independents felt Sprint's AI-themed "Evelyn" ad was perhaps a little too edgy overall. 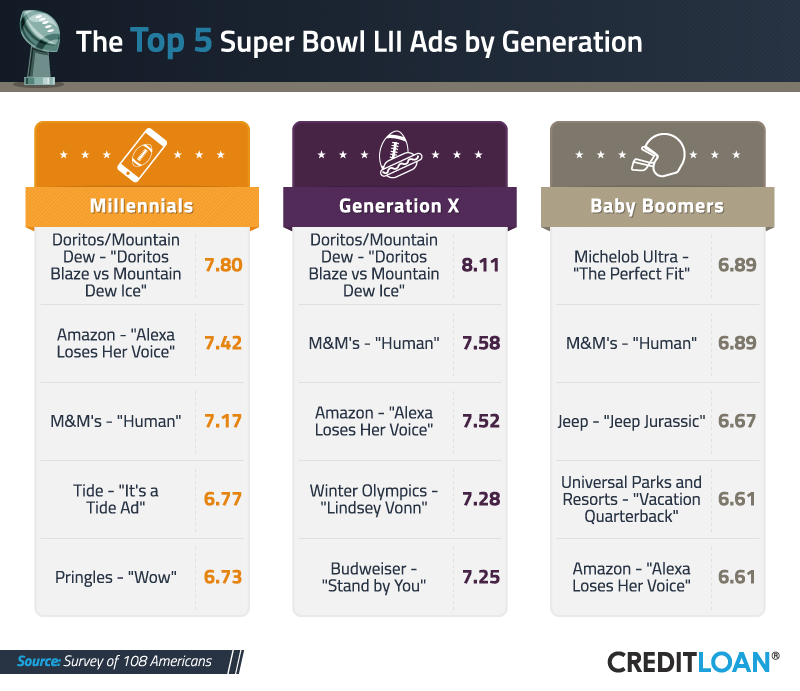 While the cost of a Super Bowl ad can be astronomical, several advertisers with household names certainly got their money's worth during this year's game, with consumers rating several ads as the consistent winners. At CreditLoan®, we're dedicated to helping people get their expenses in line and providing information and practical tools that everyone can use in their financial lives. We collected responses from 108 Americans who paid attention to the TV commercials while watching Super Bowl LII from Amazon's Mechanical Turk. 58% of respondents were male, and 42% were female. The sample size was 108 people. It is possible that with more participants, we could have gained more insight into this population. No statistical testing was performed, so the claims listed above are based on means. As such, this content is exploratory, and future research should approach this topic in a more rigorous way. The data we are presenting rely on self-reporting. There are many issues with self-reported data. These issues include but are not limited to: selective memory, telescoping, attribution, and exaggeration. It is possible that the fact that our respondents took the survey on the internet is a confounding variable. Future studies should explore this relationship. If this year's findings thoroughly entertained you, please feel free to use any images or statistics from our study on your own website for noncommercial purposes only. We only ask that you link back to this page to ensure the authors get proper credit for their work.